Astronomy Now - See the Moon join a midnight planetary parade from 21–28 July | Astro What? This looping animation shows a wide-angle view of the southern UK sky at midnight from 21–28 July 2018, a week where the Moon will be your celestial guide to three prominent naked-eye planets. On 21 July, the 8-day-old waxing Moon nestles near Jupiter low in the west-southwest. On the 25th, it’s Saturn’s turn to lie close to the 12-day-old gibbous lunar disc. Finally, on the night of 27-28 July, it’s the turn of dazzling Mars at opposition to cosy-up to the post-totally eclipsed Moon. For scale, this view is about six spans of an outstretched hand at arm’s length wide. Click the graphic for a full-size view. AN animation by Ade Ashford. If clear skies persist over the coming week, observers in the UK can view four naked-eye planets with little difficulty. First up is Venus, always the brightest planet, presently visible low in the west at the end of civil twilight some 45 minutes after sunset. Venus currently sets around 1½ hours after the Sun. As evening twilight deepens to dusk in the British Isles, largest planet Jupiter is next to make its presence known about an hour after sunset low in the southwest (note: you can always use our online Almanac to obtain local sunset information, and far more). Shining at magnitude -2.2, Jupiter is therefore almost six times fainter than Venus. 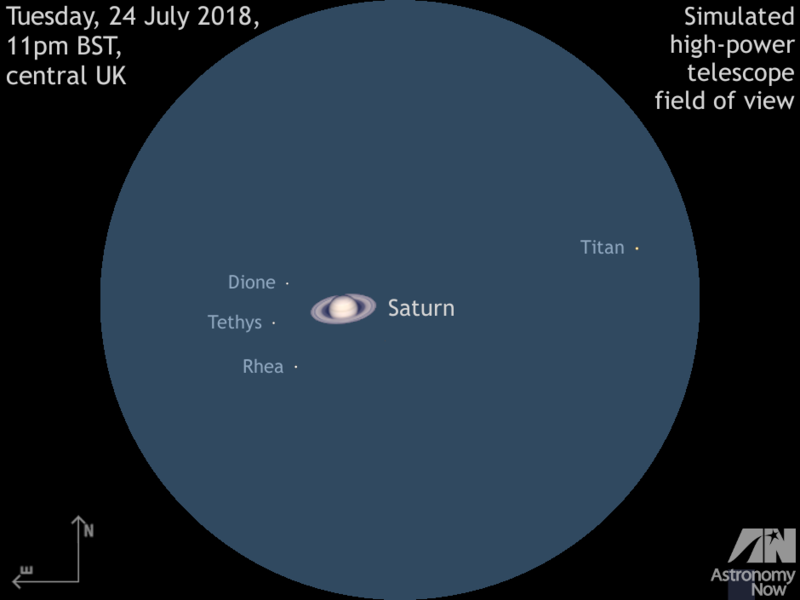 The aspect of Saturn and its brightest moons Titan and Rhea, with lesser moons Tethys and Dione for larger backyard ‘scopes, on the UK night of 24 July. Observers with Newtonian/Dobsonian telescopes should rotate this image through 180 degrees to match their eyepiece view, while users of refractors, Schmidt- and Maksutov-Cassegrains with a star diagonal need to mirror this graphic left-right to replicate what they see. AN graphic by Ade Ashford. If you need help identifying Jupiter, the 8-day-old waxing gibbous Moon lies a little more than 4 degrees to the upper right of the planet on the night of 20-21 July. You’ll see that the pair is easily encompassed within the same field of view in binoculars of 10× magnification or less. If you own a telescope of 7.6-cm (3-inch) aperture or larger, note that Jupiter’s Great Red Spot is best placed at 9:44pm BST on 20 July. See this article for other Jovian events occurring this month. Next up for a lunar conjunction is Saturn on the night of 24-25 July. At 11pm BST on Tuesday 24th the 12-day-old gibbous Moon lies highest in the southern sky of the UK just 4 degrees to the upper right of the ringed planet. Again, binoculars of 10× magnification or less will show Saturn and the Moon in the same field of view. Coincidentally, this is also the night to see Saturn’s largest moon, magnitude +9 Titan, close to greatest westerly elongation from its parent planet. 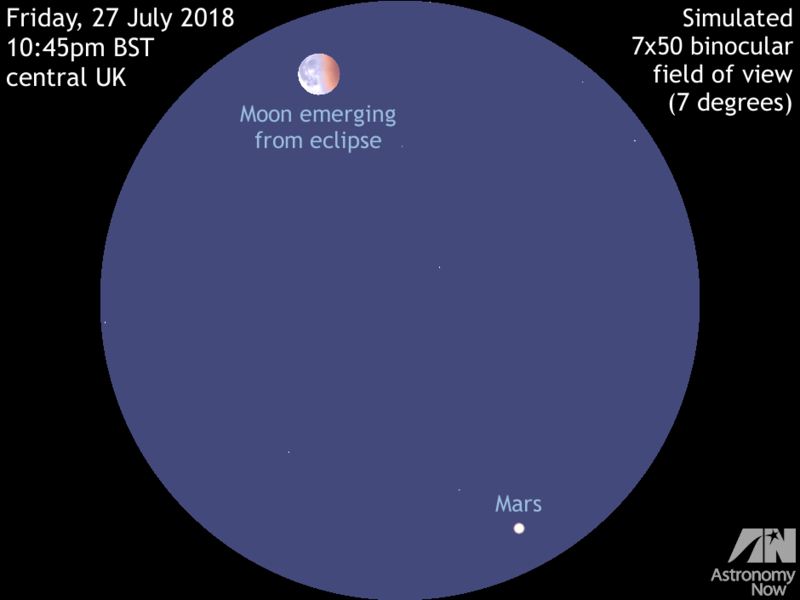 This graphic simulates a 7×50 binocular view of the Moon emerging from total eclipse and planet Mars within the same field as seen from the centre of the British Isles around 10:45pm BST on 27 July. The Moon and Red Planet are 5.9 degrees apart. AN graphic by Ade Ashford. For the grand finale of our line-up of lunar and planetary conjunctions this month it’s the turn of the Red Planet at opposition to get close to the full Moon during the longest total lunar eclipse of the 21st century on the night of 27-28 July. Observers in the British Isles should find a location that offers an unobstructed view of the southeast horizon from 10:30pm BST on Friday 27th to see the blood-red Moon emerging from eclipse with fiery Mars dazzling at magnitude -2.8 some 6 degrees below. On opposition night the Red Planet has an angular size of 24.3 arcseconds, hence a telescope magnification of just 75× is sufficient to enlarge it to the same size as the adjacent Moon appears to the naked eye, while users of 7× binoculars can see both the Moon and Mars in the same field of view.